Danelectro Standard Shorthorn Model 3612 Model Electric 6-String Bass Guitar (1962), made in Neptune, NJ, serial # 3082, bronze lacquer finish, masonite and pine body, poplar neck with rosewood fingerboard, gig bag case. 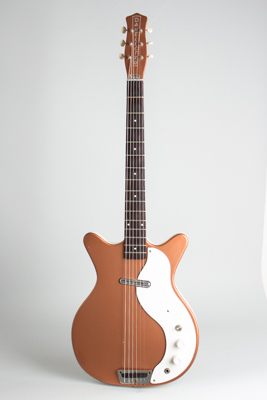 This is a fine-playing, beautifully preserved, all original example of a relatively uncommon Danelectro creation. While the original Shorthorn guitar and the matching 4-string bass are fairly common as old Dan-O's go, the 6-string bass version was made in far smaller numbers than either and is a much more difficult find. This copper-top beauty is a nice early '60s example of the model and has all the "classic" 1962 Dan-o features: semi-hollow Masonite and pine body with the "seal"-shaped white Masonite pickguard, white pebble vinyl side covering, one-piece metal strap buttons, and white plastic ridged knobs. The single lipstick tube pickup is controlled with a volume and tone knob, the latter mated to a 3-way tone modifier switch that offers two different roll-off settings for bass and treble. The short 15-fret neck has a Brazilian rosewood fingerboard and is topped with the trademark "coke bottle" headstock with vertical "the silver Danelectro logo, "Totally Shielded" sticker and openback Waverly strip tuners. This is a great sounding 6-string bass/Baritone guitar with the classic Danno twang factor, even with only a single pickup. Overall length is 38 1/2 in. (97.8 cm. ), 13 1/4 in. (33.7 cm.) wide at lower bout, and 1 5/8 in. (4.1 cm.) in depth, measured at side of rim. Scale length is 29 1/2 in. (749 mm.). Width of nut is 1 11/16 in. (43 mm.). This is a super clean, all original example, with just some light wear and no repairs or alterations. There are some small chips and dings to the finish and what looks like superficial "strap marks' on the back, but that's about it. One of the nicest of these we have had and a very fine instrument-especially considering it's made of Masonite! This Danno currently set up in Baritone (B-B) tuning but easily adaptable to A-A or its original 6-string Bass (E-E) configuration as desired. Includes a modern gig bag. Excellent + Condition.